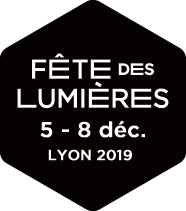 Would you like to be a part of the artistic programme of the 2019 Festival of Lights? Dematerialized, although this does not involve sending your application by email! The projects, installations or events proposed on selected sites are participative, innovative, convivial, surprising and fun. These sites are laboratories for light experiments that help young designers and new talents to emerge. Applications must be received before the end of 13 May 2019. • By post to "Ville de Lyon - Direction Evénements et Animation - Fête des Lumières - 69205 Lyon Cedex 01"
Important: Only complete applications will be considered. • An artistic section, describing your project and including visual simulations (photos, videos, etc.) and a synopsis or statement of intent. • A full technical section, describing your equipment and organisation (naming a technical manager). • A list of references of the various people involved in your project. For key project bids: the required documents are in the tender dossier. For emergence projects: the team (or artist) submitting the project must have a structure or be attached to a structure that can receive a subsidy.